The word, CONGRUENT, means to be together, in agreement. As you read about what we entitle the Tower of Babel, we remember that GOD came down and confused their languages so that they would not be able to carry out their plans. OF course we know that they could not reach the heavens or throne room of GOD with any physical structure. Space ships cannot accomplish such. But the fact that nothing would be impossible for them to achieve if they were in agreement, shows us the value of being congruent. The Triune GOD, the Father, Son and Holy Spirit, are never able to be divided. They are in total agreement, always. Nothing separates them from purpose, plans and divine will. 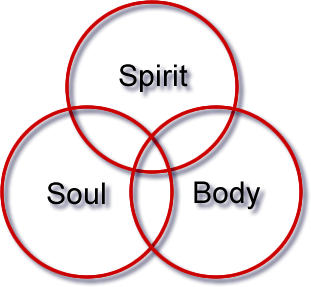 We have also been made triune: Spirit/heart, soul (mind, will and emotions), and body. When a church is divided against itself, a family divided, a business divided, a marriage divided, and there is no agreement, no shared purpose, no communication, no fellowship, no joint purpose, no companionship, no direction, it will fall and fail. Agreement and becoming congruent are the KEYS to survival in any of the above. Churches, marriages, businesses, relationships, families become self-destructive when they are NOT able to communicate, in order to become unified. They can blame it on any other thing, but agreement and unity are imperative if success and survival is going to happen. A house divided against itself CANNOT stand! Look at this further than you have ever done before. Each of us are the temple of GOD, or house of GOD. Rather than looking at community, look at yourself. GOD is ONE GOD, even though there are three parts and personalities. THEY are a tri-unity! The self-destruction comes when we are NOT congruent. What do I mean? You are body, soul and spirit. The spirit and heart are the same thing. The soul is the seat of your mind, will and emotions, and then there is your body. The struggle that most have is becoming ONE within themselves. When you cannot have agreement between your body, soul and spirit/heart, you are divided against yourself, and YOU CANNOT STAND! It is important for you to be every wit whole. Align your body and soul with your spirit/heart. Become unified in purpose, thought, action. For when we cannot become undivided, when we cannot get our own selves to agree, then we will surely fail. The spirit is willing, but the flesh is weak. That is why the apostle Paul indicated that he had to die daily. He buffeted his body and brought it under subjection to his spirit man. It was a daily struggle for him to force his own body to comply with his heart, and also to get the MIND OF CHRIST to superintend his own human mind. The battle within is the worst one. For we look at external forces and neglect the war that we have between the flesh and the spirit. They must come into agreement, must become aligned in purpose, must go the same direction, must communicate, must be congruent to STAND! Divided against yourself is when your body and mind, will and emotions go in one direction, and your spirit another. We must overcome! Death to our personal will is a battle we must LOSE, to obtain the perfect will of GOD. We come into that personal unity of faith when we submit to the will of God, His purpose, His vision, His plan, His Word, and His work. To come to agreement within is when we allow Him to bring us into total agreement with HIM, in our body, soul and spirit. To win souls is wise. That is not becoming saved or born again. The soul is the seat of the mind, will and emotions, not the heart. Look at the soul as being the determiner. For your body will go in the direction of what the mind dictates. If we have the mind of Christ, that superintends our own mind, then we will bring the body into subjection and obedience. The Lord lives in our HEARTS, by faith. Our bodies are to be the temple or house of GOD, and we are to forfeit our own thoughts to the obedience of His higher thoughts. Let us become congruent and align our own selves to be in agreement. A HOUSE DIVIDED AGAINST ITSELF CANNOT STAND. Each of us need to strive for agreement of our own three parts, so that we can succeed in fulfilling the purpose and plan and vision and destiny that GOD has given us. For when we are divided against our own selves, we will not stand. Before we seek agreement with anyone else we need to first be together ourselves. Then we are to align with others in friendship, community, ministry, and know and pursue the purpose that GOD has ordained for us as in a marriage, family, ministry and church. Before becoming one in marriage, if you are not in agreement and one with your own self, if you are not aligned with your own purpose that God has created you for, then it is futile to believe that you can be aligned with another person, and be able to stand together as an indestructible unit as partners, family, business, church or community. Let us strive to be undivided, and aligned in body, soul and spirit, with CHRIST!